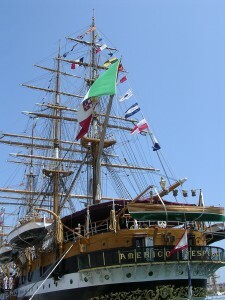 The largest traditional sailing boats in the world will be in Toulon (France) in September 2013. For four days, from September 27-30, the grandiose show of Tall Ships in the most beautiful bay in Europe should attract, at the very least, 500 000 visitors. The Tall Ships Regatta, popularised by her previous sponsor under the name of “Cutty Sark”, is a prestigious running aiming at promoting the sail to the young people of the whole world. Few French harbours had the honour to welcome her in the course of twenty last years (Saint-Malo, Claret, Brest, Cherbourg). For Toulon, it will be the second time, six years after the success of edition 2007.